With Mercedes taking an option to join the electric racing series in 2018, we imagined what a Mercedes Formula E Concept livery might look like. As Formula E continues to make waves in the racing world, larger manufacturers are starting to take up interest including the FIA Formula 1 world championship winning team Mercedes. We decided to take a look at the current livery used by their F1 race team and bring it into the world of Formula E. This involved taking a look at all the sponsors that would be appropriate for an all electric racing series, so first of all their current F1 sponsor Petronas, a Malaysian oil and gas company, has to go. 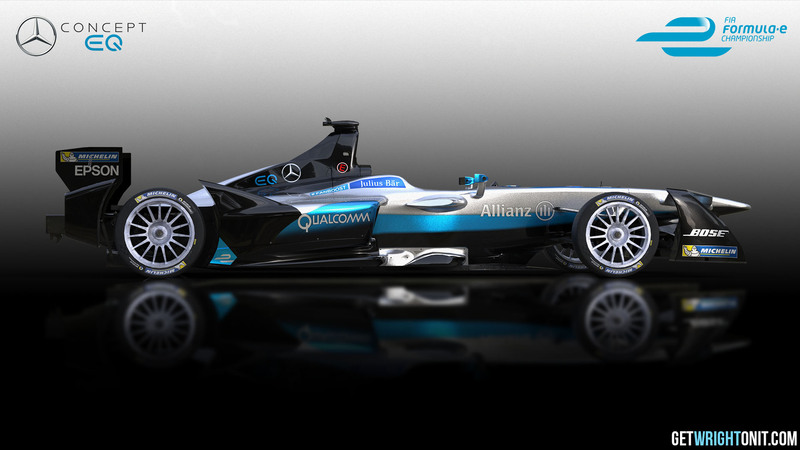 Looking over the other major Mercedes F1 partners, Qualcomm are at the forefront, which seemed a great opportunity to use as a main sponsor due to Qualcomms already existing technology partnership with Formula E.
Mercedes have also recently launched a new electric road car division under the branding “Concept EQ”. Formula E seems an obvious choice to advertise this new product brand, so we not only introduced the Mercedes Concept EQ branding, but color theme as well. 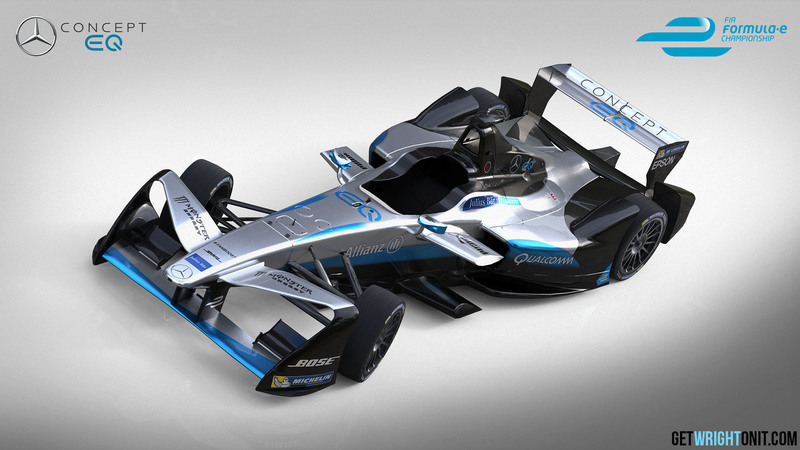 This electric blue ties in nicely with the current set of sponsors across all Formula E cars, Julius Bar, Michelin and the turquoise used for the #Fanboost promotion. We really hope that this Mercedes Formula E Concept can make a showing in the real FE 2018/ 2019 series as optioned. As more major car manufacturers move into electric racing, the more this technology and research can make its way into improving road cars, which is something we at Get Wright On It are very excited about! We also rendered a couple of video clips of this car and our recent Ferrari and Redbull Xwing concepts, which can both be seen on our 2017 showreel. 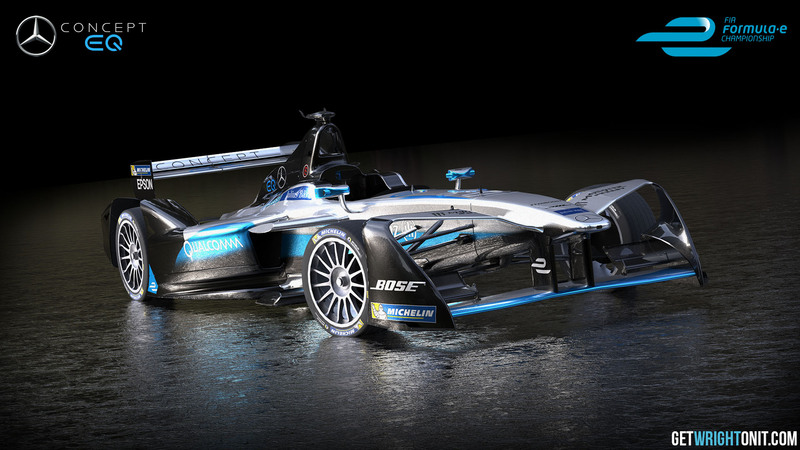 What do you think of a potential Mercedes Formula E team? Let us know in the comments below or get in touch on Twitter and Facebook.